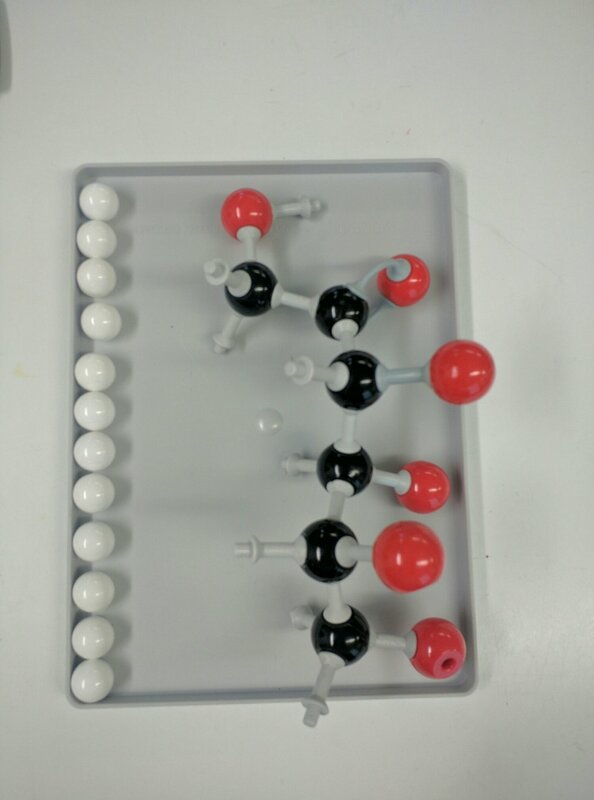 Modelling with Molymods is absolutely essential to understanding condensation reactions between monomers and it is something that many students really enjoy. I recommend that you do this as a whole class activity. Careful management and guidance are needed so all students succeed in making glucose (and then proceed to carry out condensation reaction and form maltose with a glycosidic bond). First discuss the nature of a hexose sugar and the (CH2O)n formula. Then, count into the lid 6 Oxygen - Red, 12 Hydrogen - White, 6 Carbons - Black (make sure they all have 4 holes in them. Then put an Oxygen on each of the other carbons. now fold the double bonded oxygen until it gets close to the C1. And then, open one of the double bonds to the oxygen, remove a hydrogen from c1 and then bond the oxygen into the hole left by the removal of the hydrogen. then move the spare H to the C5. and you have now made glucose. Next you should do a condensation reaction between the 1 and 4 carbons (of two glucose monomers) to form maltose, producing water and a glycosidic bond. Then join the maltose to form the polysaccharide amylose. Finally, hydrolyse the amylose back to maltose (amylase does this in digestion).